Hong Kong is increasingly subject to the demands of the boss in Beijing. There is no denying that Hong Kong’s has taken several steps closer to full absorption by the motherland. There is an innate tension between enjoying the international privileges Hong Kong has long been accustomed to and increasing allegiance to the Communist party. No, it has not yet reached the stage where Hong Kong, the longstanding Anglicization of the Cantonese name, has to be referred to as Xianggang, the term used in pinyin, mainland China’s version of romanization. And yet, there is no denying that the supposedly autonomous region has taken several steps closer to full absorption by the motherland. These steps have been either actively encouraged by or at least not resisted by the local administration. Its servility is shocking. Until now, none of these seemingly “little” moves has significantly undermined the special status that Hong Kong’s economy and its people enjoy in the outside world. The territory is treated as a free trading port with a separate currency and freedom from foreign exchange control. Hong Kong’s permanent residents hold Chinese passports issued locally and enjoy travel freedoms unknown to mainlanders, with visa-free entry to a huge number of countries which otherwise demand visas for Chinese citizens. The very same Hong Kong government that demands its people show undivided loyalty to the regime in Beijing is also hard at work trying to persuade Washington that it is commercially independent — and thus should not be hit by Trump’s tariff assault on China. Given that Hong Kong itself manufactures very little, it is not in Trump’s direct firing line. However, it remains to be seen whether, if the tariff war is extended, shipments of mainland made goods through Hong Kong become a bone of contention. There is an innate tension between enjoying the international privileges Hong Kong has long been accustomed to as a quasi-independent offshore base and the rapidly increasing willingness to adhere ever closer to central government policies and demands for “patriotic” allegiance to the Communist party and its leaders. The changing political landscape also manifests itself in the two multi-billion dollar infrastructure projects that link the island physically closer to the mainland. One is a just opened high-speed rail link which (at inordinate expense) goes to the dense urban heart of the territory. The big concession, in exchange for the building of the link, is that the mainland police is now allowed to operate on it – i.e., also on Hong Kong Island. Another is a bridge/tunnel link across the Pearl River mouth to Macau and Zhuhai. Hong Kong people and businesses are constantly being urged to see themselves as part of what is now called the Greater Bay Area, which encompasses some 70 million people spread among various cities and municipalities in the Pearl River delta. Hong Kong has a population of only seven million. 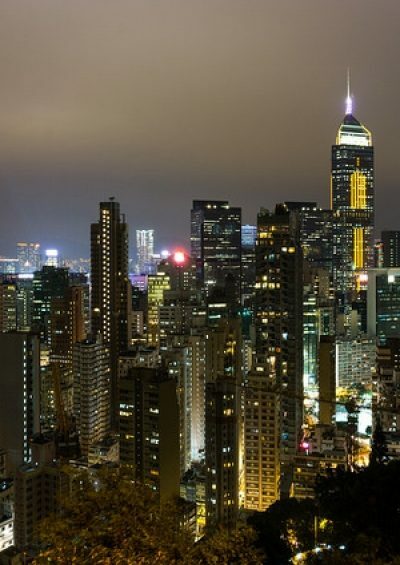 Although the concept is vague, the absorption-via-infrastructure building will begin to impinge on Hong Kong’s special status, as well as on such key aspects as the Cantonese language and use of a England-based legal system. Another aspect of Hong Kong’s diminishing difference has become starker in recent days and is being noted around the world: The erosion of liberties. As a first step, the government banned a tiny local political party, the HK National Party which advocated independence for the territory, as a Republic as separate as Singapore is from Malaysia of which it was once a part. Although the party of its young leader Andy Chan had not done anything illegal, it is now outlawed. The ban followed a row generated by Beijing’s Liaison Office in Hong Kong demanding that the Foreign Correspondents Club cancel a lunch meeting at which Chan was due to speak. The club naturally insisted that it was doing nothing illegal and carried on with an event of media interest. Now, evidently in retaliation, the supine Hong Kong government has refused to renew the work visa of the Hong Kong-based Asian news editor of the Financial Times, Victor Mallet. His “crime” was simply to have, in his capacity of Vice President of the club, presided over the meeting. As if to underscore the vindictive nature of the orders from Beijing, Mallet, who anyway was leaving Hong Kong soon to become the paper’s Paris bureau chief, was given just a seven-day visitor entry – visiting British citizens usually get 180 days. The move shocked even the normally docile foreign chambers of commerce, as well as lawyers and the local media. No explanation has been forthcoming from a government merely obeying orders from above. Ending Hong Kong’s traditions of free speech? Together with the party ban, it seemed to put an end to Hong Kong’s traditions of free speech and media. This is no trifle matter. After all, these traditions have seen famous Asian revolutionaries such as Jose Rizal, Sun Yat-sen and Ho Chi Minh use Hong Kong as a refuge where the rule of law prevailed. It is not just discussion of Hong Kong that is imperilled by these events. It can be equally viewed as “splittist” or even treasonous to discuss other issues where China’s claims to sovereignty are disputed – Taiwan, Tibet, the South China Sea etc. Beijing’s unrelenting focus has been on patriotism under the sole leadership of Xi Jinping and, based on this, the Communist party has been gathering momentum for the past three years. Now, however, one must worry that pride is turning to triple paranoia, due to the Trump assault, the troubles of China’s national economy and the criticisms of its much vaunted Belt and Road Initiative. Hong Kong is increasingly subject to the demands of the boss in Beijing. Soon enough, legal “interpretations” will be handed down for implementation and current financial freedoms will be made subject to the perceived requirements of the party and its leaders. Soon too foreign governments will reciprocate by removing the trade and visa privileges they enjoy.